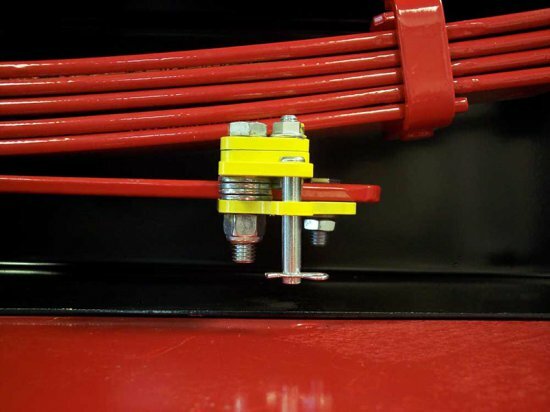 This no-drill StableLoad is designed for quick installation on vehicles with lower overload springs that come predrilled from the manufacturer. - A7310 StableLoad is a no-drill application and requires factory pre-drilled .5" diameter holes in lower overload spring. The A7310 Quick Disconnect StableLoad is designed for vehicles that have a lower overload leaf suspension with a hole near each end of the lower overload spring. The lower overload will, for the most part be shorter, thicker and will generally have separation from the rest of the spring pack. In most cases, there is a plastic disk covering the hole in question. Click here for illustration. 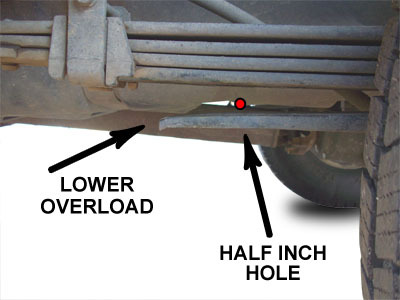 - On Quick Disconnect StableLoad (part#'s A7310/A7311): Due to wear and tear after time, some vehicle leaf springs may have minimal clearance with the lower overload for StableLoad engagement / disengagement when the vehicle is unloaded. In order for the StableLoad to engage and disengage with minimal effort, a minimum gap of 1/8" is required between the lower overload and the spring pack. - There is no fit for the 3500/E350 Cab and Chassis.